Zimmern o.R., 03/13/2014. For the second year in a row, RAMPF Dosiertechnik has been named official system partner of KUKA Roboter GmbH. The successful collaboration between the industry leaders reflects the growing importance of robotic solutions in the field of dispensing systems. Faster speeds, highest precision, maximum reliability, short cycle times – using industrial robots makes production processes much more dynamic.Robots are also being used increasingly in dispensing systems in order to fully satisfy customers’ growing quality and volume requirements. RAMPF Dosiertechnik has already succeeded in setting a benchmark in plant technology with its compact, space-saving DC-RS250 robot dispensing cell, which incorporates the KUKA KR AGILUS, the latest KUKA small robot. 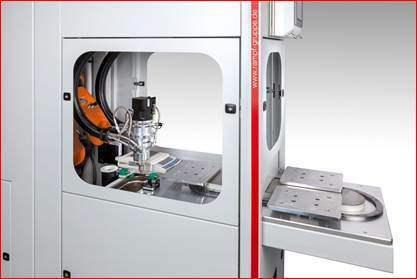 The dispensing cell can be used wherever interlinked processes are not desired, and therefore the level of automation is to be reduced, while variation in production is to be increased. The system partnership between KUKA and RAMPF Dosiertechnik is entering its second year. With over 2,500 system solutions on the market worldwide, RAMPF Dosiertechnik is one of the leading manufacturers of low-pressure mixing and dispensing systems. KUKA Roboter GmbH is among the world’s leading suppliers of robots and automated production plants and solutions. The partnership certificate was officially handed over at the RAMPF Dosiertechnik headquarters in Zimmern o.R. 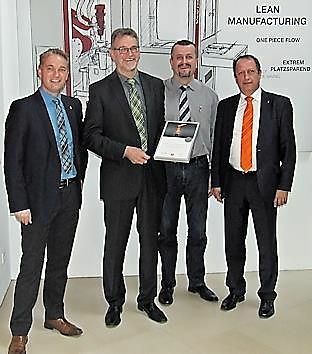 (from left to right): Bernd Besserer (Area Supervisor South at KUKA Roboter GmbH), Bernd Faller (Managing Director of RAMPF Dosiertechnik), Konrad Till (Procurement Manager at RAMPF Dosiertechnik), and Josef Oberhoffner (General Industry Germany Sales Manager, South/East branch at KUKA Roboter GmbH).